Maëlys Amat says she always knew she wanted to attend medical school. The idea of going to business school, however, didn’t occur to her until she was well into her studies at the Drexel University College of Medicine (DUCOM). Maëlys enrolled in the joint MD/MBA program offered through a partnership between LeBow and the Drexel University College of Medicine. It involves completing an abbreviated MBA between the third and fourth years of medical school, with academic credit for business courses offered through DUCOM making up the balance. A select few medical students take part each year, and she was determined to get the most of the experience. That drive led her to completing a fellowship through the Coulter-Drexel Translational Research Partnership Program; Maëlys calls the fellowship “the best thing I did outside of the MBA curriculum.” Coulter fellows provide market analysis for proposals submitted from biomedical engineering and biological sciences programs for technology commercialization. 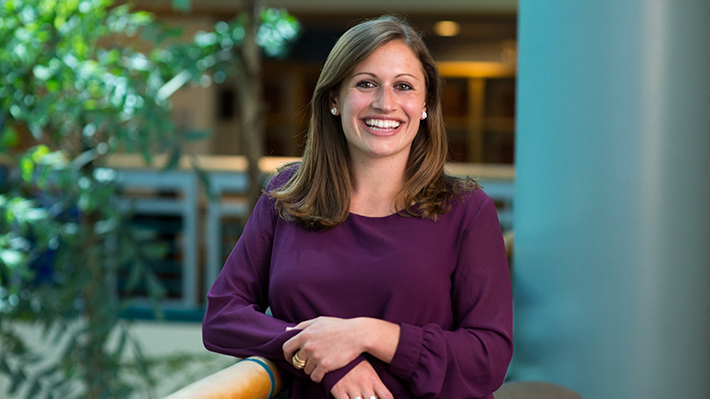 “It brought together what I’d learned in the MBA and applied some of those skills, and I met a lot of interesting people, including doctors, who were utilizing administrative and business skills in a different way,” she says. For Maëlys and other students who take part in this dual program, the MBA component requires taking a detour without getting off track, so while taking her MBA courses, Maëlys continued working with patients in DUCOM clinics. Following graduation from DUCOM, Maëlys is headed to Beth Israel Deaconess Medical Center, a teaching hospital affiliated with Harvard Medical School, where she’ll be an internal medicine resident focusing on primary care. She also previously lived in Boston after college, working for Healthcare for the Homeless through AmeriCorps.